Homelessness is a major problem in London today. On any given night in London, there are likely to be more than 1,000 people sleeping out on the streets (nearly treble the number there were in 2010) and there are many more who are in hostels or other temporary accommodation but who don't have a home to call their own. It can be incredibly damaging for people, and the average life expectancy of a homeless rough sleeper is just 47 years old. People end up homeless for many different reasons and many need specialist help to get back on their feet and find a secure home. Those who have been homeless can require a lot of different types of support beyond help with securing housing, such as with mental health and addiction issues, understanding their rights, and with building their employability, skills and self-confidence. With the right support, people who are homeless can turn their lives around. There are lots of great charities throughout London that work hard to provide these services; many of them are small and not very well-known and funding can be hard to secure. Streets of London is a charity that works to raise money to fund the essential and life-changing work that these organisations are doing. Since 2014, Ellie Goulding's annual Christmas gig for Streets of London has raised more than £300,000, which has helped the charity to fund dozens of projects that are helping homeless people turn their lives around. Streets of London provides funding to a range of projects that offer homeless people the specialist support they need to get off the streets and make a fresh start. Projects we've funded include a winter night shelter for vulnerable rough sleepers, a rehab hostel for people recovering from addictions, a life skills programme for young homeless people, also several employment support projects, which help homeless people to look for jobs and then find and keep work. We’ll soon be announcing a new round of grants. 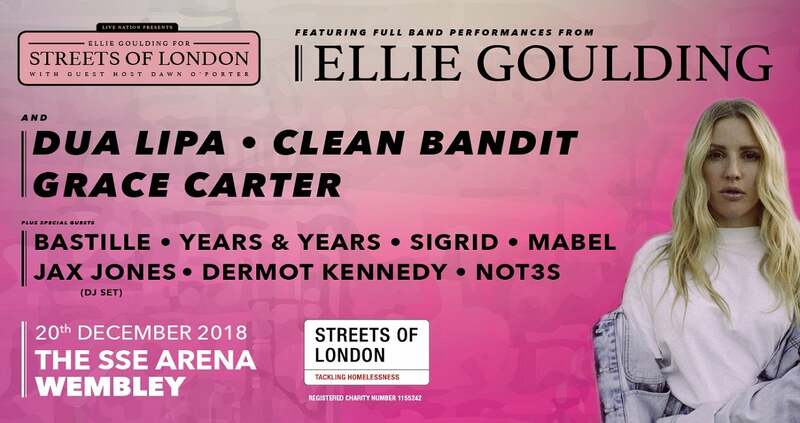 The involvement of Ellie, and the many stars who have generously supported Streets of London by giving their time and talents, also helps raise awareness about homelessness, particularly among young people, engaging them in the issue and the need to work for change. The UK is one of the wealthiest countries in the world and London one of the wealthiest cities - no one should be spending night after night sleeping on the street. By working together we can make a real difference and help support those who are struggling to get off the streets for good.